Although national events kept much of our focus in 2016, it was a busy year locally here in Prospect Heights, and if you blinked, you might have missed something. Here are some of the highlights of the past twelve months. 2016 got off to a fast start in January when NYC Schools Chancellor Carmen Farina announced that the DOE would respond to community calls for its new facility at Atlantic Yards to be a dedicated middle school. In April, organizers of the M.S. 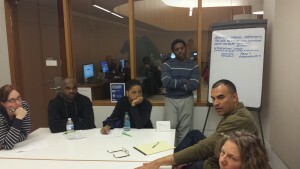 OneBrooklyn campaign sponsored a design charrette for parents, residents and elected officials to weigh in on the design of the new school. In February, the National Parks Service added 612 buildings to the Prospect Heights National Register Historic District, bringing the total number of neighborhood buildings on the National Register to nearly 920, and increasing the number of properties eligible for State and Federal preservation tax credits. It took more than twelve years from Atlantic Yards' first announcement in 2003, but in 2016 the renamed Pacific Park project finally began marketing affordable apartments through New York City's lottery system. A total of 479 affordable apartments were offered, 181 at 461 Dean Street in June of 2016, and 298 at 535 Carlton Avenue in September. In November, Atlantic Yards was back in the news as Forect City Ratner announced it was delaying additional building starts at the project due to an oversaturation of luxury apartments in Brooklyn. A panel discussion on the effects of fifteen years of gentrification in Prospect Heights was held in June at Brooklyn Public Library as part of the Intersection | Prospect Heights project. Panelists included Professor Tom Angotti of Hunter College, Regina Cahill of the North Flatbush Business Improvement District, Catherina MBali Green of ARTs East New York, Deb Howard of IMPACCT Brooklyn, and Public Advocate Letitia James. The Intersection team also released a "guidebook" Our Places, combining old and new neighborhood stories with a timeline of development in Prospect Heights, associated demographic changes and community perceptions captured from project's online survey. Through the year, Prospect Heights continued to build its reputation as a destination for dining, as new restaurants like Bopsot, El Atoradero, Faun, Tygershark, and Olmstead opened shop on Vanderbillt and Washington Avenues. And the year goes out with a bang this month as PHNDC and Borough President Eric Adams announced that historic street lights, traffic signals and pedestrian signals would replace existing fixtures on Vanderbilt Avenue from Atlantic Avenue to Plaza Street. The project is intended to make the avenue more attractive for customers of local businesses, and has already been approved by Community Board 8 and the Landmarks Preservation Commission. What will 2017 bring? Among other things, we'll be watching for those lights to be installed. Citi Bike is slated to roll out service in Prospect Heights next summer. And there may be some movement on the proposal to build Brooklyn's largest office tower across from Barclays Center at Atlantic Yards. If you want to stay on top of what's going on in Prospect Heights, be sure to subscribe to PHNDC"s email bulletin. We look forward to seeing you in the neighborhood in the new year!